If you're looking for ideas for your wedding rehearsal dinner, there are a lot of great options and very few rules. Many are under the impression wedding rehearsal dinners are formal affairs to be held in a certain type of restaurants or catering halls, but this doesn't have to be the case. So get creative and plan a fun one. Live near a lake, river, or coastline? Then book yourself a wedding rehearsal aboard a boat. It is about as expensive as booking a hall or area restaurant with the added benefit of privacy, changing scenery, and quite possibly the experience of a lifetime. A wedding rehearsal is the perfect excuse for booking a yacht for a few hours and hosting a truly memorable meal. The style of the boat will dictate the formality, and most marinas offer quite a selection. 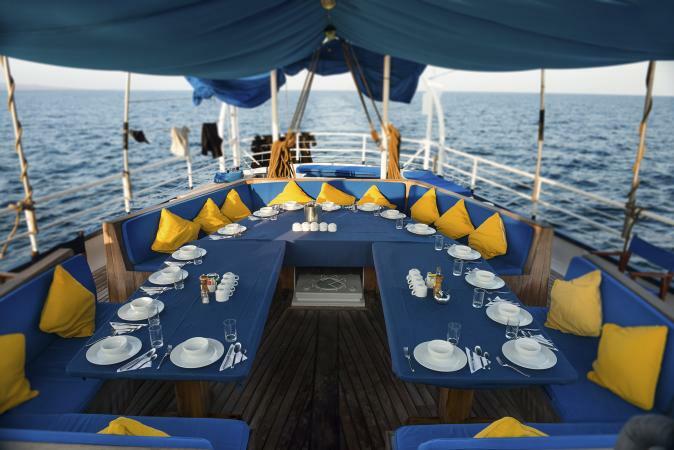 Many yachts already have cooking staff, but you can always hire catering services if you want something in particular. Make this cruise your own. Decorate the boat just like you would any other location; you can go as casual or as formal as you want. Choose a romantic marine theme or go as chic and modern as you wish. Prepare memorable playlist as background during dinner and as the evening progresses. Coordinate with the crew the length of the trip, the destination, and general schedule... or even just staying at the marina for a certain amount of time. Add nautical touches to your design scheme including invites, menu, and mementos. Of course, you can bring all that nautical flavor inland and have your wedding rehearsal at a seafood restaurant. You can even bring the sea home and set up a marine theme for a wedding rehearsal at home. Choose one of his paintings, your favorite, as the emblem of the night and draw your inspiration from it to choose your color scheme and general tone of the dinner. Rework a photo of you and your sweetheart and make it look like one of his paintings (yes there's an app for that!). Draw inspiration from the art to personalize invites and menu (perhaps a motif from your chosen painting). Coordinate the flowers (in Chagall's case simple and wild), the food style (Eastern European), and even the formality and decor (informal and dramatic) to resonate with your chosen art piece. Any artist and any kind of art, whether painting, photography, music, or even performance can be the source of inspiration for fabulously artistic wedding rehearsal. When high quality beer and tasty German treats meet a quaint garden, something wonderful comes to being: a biergarten (beer garden)! Most biergartens showcase a selection of high quality brews, a wholesome salad bar, pretzels, other baked delights, and of course, a delicious medley of wursts and roasts. 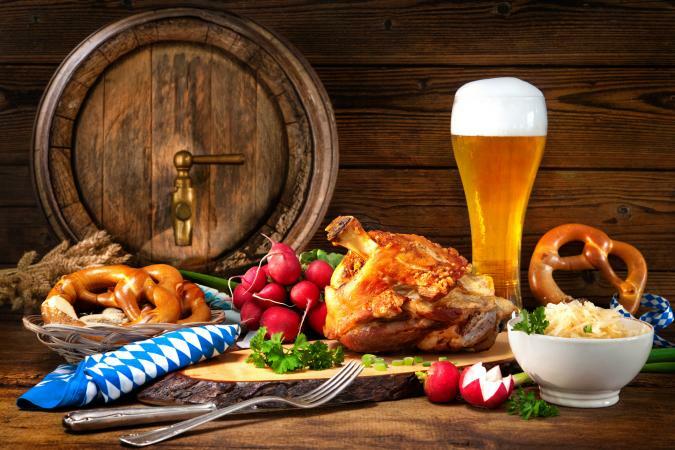 Host a casual, fun, and relatively cheap rehearsal dinner at your local biergarten, book a hall at your local brewery, or add a Bavarian twist to your favorite garden or backyard; you can even take it to a park. Personalize beer to meal pairings to create a perfect match, just like you and your sweetheart. Accent the tables with rustic flowers on thick glass jars or mini wooden barrels. Make the most out of those lovely heart shaped pretzels to create a photo op that is as cute as it is delicious. Include a wildflower, rustic, or even a pretzel or beer motif into your invites and mementos. After all, this is the rehearsal dinner and you can definitely keep it lighthearted and fun. You can play up the Bavarian factor with the music and the decor or draw inspiration from it. The main point is having good food, a nice brew to wash it down, and a laid back relaxed environment to enjoy your wedding rehearsal. An Italian trattoria, a French Bistro, a Chinese restaurant specialized in dim sum courses, a Korean barbecue, a sushi bar or teppanyaki restaurant, a Mexican restaurant, an Indian curry house, a Spanish tapas bar, and a Lebanese grill all offer delicious food and international flavors that please many. The restaurant is optional. If you know a great little Greek place with the best moussaka and lamb but the ambiance does not match your ideal aesthetic for the wedding rehearsal, you can have them cater the food at the location of your choice. Most restaurants says yes. Do a little research on your destination of choice. You can easily reflect the culture with some key elements. For instance, bring Indian night to life with bright fabrics in deep oranges and rich pinks, candlelit centerpieces, marigold flower arrangements, a touch of mehndi design on the invites, and a menu to match. Couples with diverse cultural backgrounds can deliciously represent their union through fusion cuisine whether you choose a restaurant that offers just the right combo or you design the menu yourself. Include elements of both your cultures such as art, language, and food. You will not only honor both your families' heritage, but you can also show how well paired you are. Many restaurants with dedicated cuisine styles offer rich ambiance and separate spaces for groups beautifully decorated. In terms of decor and budget, sometimes going for foreign cuisine can be a win-win. No need to go all the way Hawaii to experience the delicious food and exciting culture that has fueled many an island dream. You can hold a luau for your wedding rehearsal and party the night away to a tropical island beat. 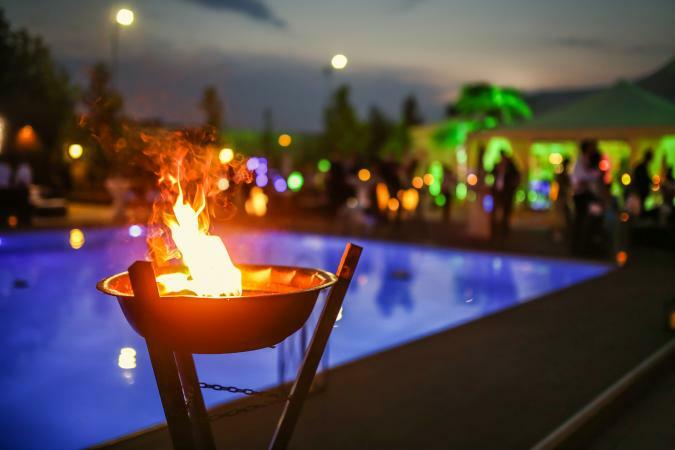 You can hold a great luau in a tiki bar or lounge, at a beach club, or even in your backyard. Polynesian and South East Asian restaurants work well, too. Choose bold island decor that includes tiki torches, palm trees, big fronds, and tropical flowers in bright colors. Play tropical sound effects like rain, birds, and Polynesian music (think Tiki Room at Disneyland). Serve delicious tropical concoctions and a menu that features fresh tropical fruits, seafood, and a roasted pig. Add kitschy tiki motifs to the invites and menu. Have flower leis for everybody and maybe even require a grass or leaf skirt for all guests. There is plenty of fun to be had with a luau and if you set the theme just right, you can transport your wedding rehearsal to the middle of the Pacific in the beat of a drum. The beauty of wedding rehearsals is they give you an opportunity to spend quality time with your closest and dearest. Take this opportunity to unwind, celebrate, and have fun together before the big day. Remember, you can go all out or keep it simple and quaint; you have plenty of freedom and the options are limitless.